Here we go with part 7. Gladys Lake. Gladys Lake first appeared on a map in 1953 and was probably named for the wife of Archie Mahan, a packer and former miner who ran the Red’s Meadow operation for twenty-seven years starting in 1934. Mr. Mahan was also a politician, serving as Mono County Supervisor for twenty years. He must have done a good job; he ran unopposed during every election in which he was a candidate. From 1890 until 1905 Yosemite actually stretched this far south, and this lake was in the park. Trinity Lakes. 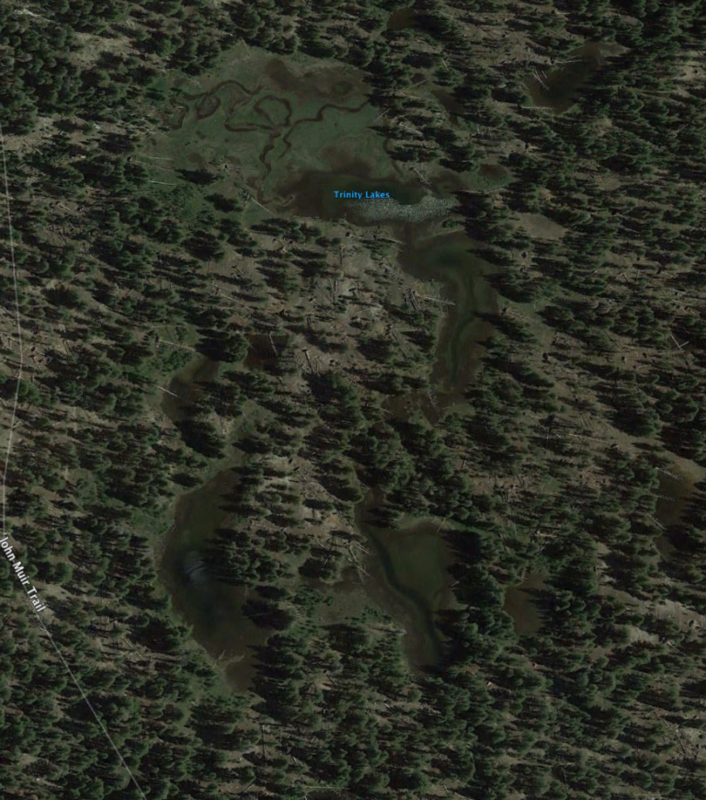 The Trinity Lakes are a group of small, shallow pools connected by a minor stream. They are easy to walk by if you are hurrying down the trail since they are not immediately visible. In the late summer and early fall they make a great break spot, so consider looking for them. In the spring they are hard to see through the swarms of mosquitoes. The origin of the name isn’t known, but presumably refers to the fact that there are three larger pools. 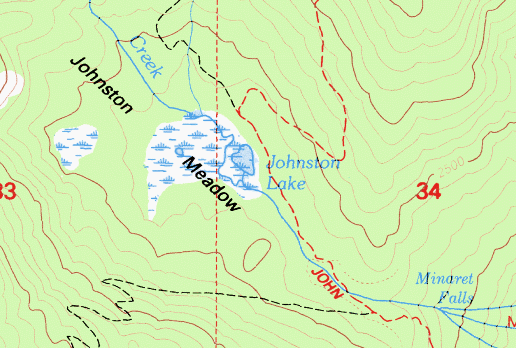 Johnston Lake and Meadow. The Minaret Mine was established in 1878, six miles west of the Devils Postpile. It produced lead, copper, zinc, and silver off and on for several decades, until operations ceased in 1930. The mine was owned by C. C. Randall and was operated by Johnston family. The lake and meadow got its name from that family. The Devils Postpile. 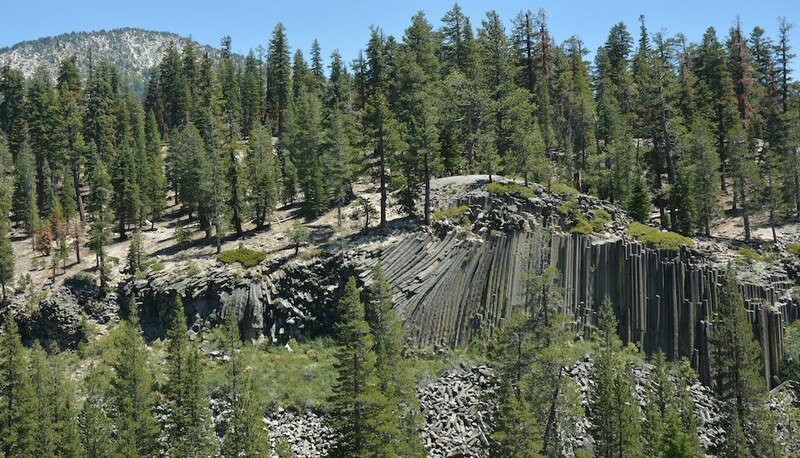 The Postpile is one of the world’s best examples of columnar basalt. There are several others like it in the United States, and you can find these rock formations in other countries around the world. Columnar basalt has even been discovered on Mars. Perhaps the most famous is the Giant’s Causeway in Ireland. The Devils Postpile is near the town of Mammoth Lake at about 7,500 feet elevation. You can’t get to the foot of it from the John Muir Trail, but a trail which branches off the JMT and then re-connects at Red’s Meadow, passes by the base of the rock formation. My unscientific guess would be that 90% of JMT thru-hikers take the trail that goes by the Postpile. In 1911, President William Howard Taft signed a proclamation naming it the “Devil Postpile National Monument.” That seems to make the word “devil” an adjective, attributing to the rocks, themselves, a certain ferocity. (The German army, in World War I, for example, called U.S. Marines Devil Dogs.) While using “devil” as an adjective to describe some rocks is indisputably ridiculous, the string of words does have the advantage of actually meaning something. By mid-century, maps and signs added the “s” that is the convention today, but without the apostrophe. That is what you will find in all the current National Park Service literature. If I were king for the day, I’d put the apostrophe back in; I kind of like the sinister connotation. Besides, those slender, towering columns do look a little creepy – it’s like they know something about you, and they know that you know that they know. 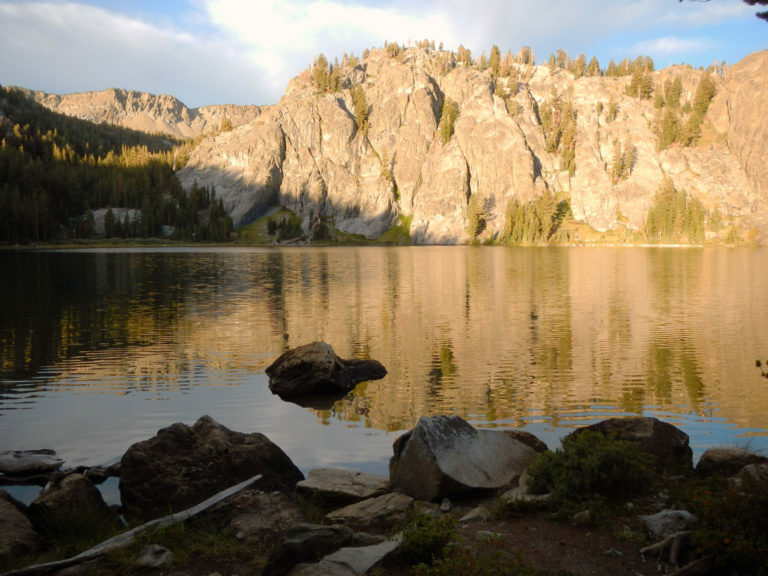 One of my favorite hikes up near the Minarets a most lovely place to spend the night is Rosalie Lake! Quiet, serine, and full of stars on a moonless night. I encountered my first ( and last) mountain lion on that trail and some others had issues with a bear at the far end of the lake. I will always have fond memories of this lake and go back when ever possible. This narrative continues to fascinate. Looking forward to it every week now. On the Postpile, though, I think the name actually derives from the ungodly crowds you have to deal with to get close to it. I could have sworn I saw it from the trail, and I’ll take that view over the crowds in the future. http://cires1.colorado.edu/people/jones.craig/Llama/PostpileD4.jpg And if I am not mistaken, there is more columnar basal visible to the west of the Rainbow burn.